The Reese brothers, Fred and Albert, grew up in a German-speaking farm community in Minnesota in the 1880s. It was a hard-working life with limited opportunities, and the boys’ formal education ended at the eighth grade. From then on they worked on the farm and later in other laboring occupations. Fred Reese married in 1906 at age 28 and he and his new wife, Nellie, lived in the home of Nellie’s parents James and Agnes Russell in Brainerd, Minnesota. The Russells ran a boarding house located near the town train station. Both Nellie and Agnes helped with the cooking, while Fred Reese worked outside the home as a blacksmith. Fred and Nellie named their first child Russell Reese, in honor of his maternal grandparents. In those early years before 1910, we can speculate on whether Fred and Nellie had ever even heard of Seattle, let alone imagine that they would someday live there. In 1932 Fred Reese built this log-sided house in Wedgwood. The writing on the photo gives the plat name of Pontiac Addition, Block 49 Lot 2. The house was at first numbered 3704 because there was as yet no 38th Ave NE. Later the house number was changed to 3804 NE 87th Street. The marriage certificate of Albert Reese and Edith Townsend shows that they were married at the Townsend family home. Edith’s brother CJ and his wife Stella signed as witnesses. Fred Reese’s younger brother Albert followed his heart out to Seattle in 1910 when he was 26 years old. James Townsend, father of Albert’s long-time sweetheart, Edith, had taken his family from Brainerd, Minnesota, out to Seattle in search of better work opportunities. Albert followed the Townsend family and married Edith in Seattle in 1911. Albert then brought his widowed mother, Emilie Reese, from Minnesota. Emilie helped Albert and Edith as they tried their hand at truck farming (growing vegetables for market) and raising poultry in rural Cedar Valley, Snohomish County, in what is now Edmonds, Washington. City logo of Brainerd, Minnesota. Brainerd, Minnesota, where Fred and Nellie Reese still lived in the 1920s, was a railroad town. A railroad president had given the town his wife’s family name, and nearly every job in Brainerd had to do with the railroad. Boarding houses and hotels like that of Fred Reese’s father-in-law, James Russell, served railroad workers and travelers, and the foundry where Fred worked fabricated parts for repairing rail cars. A nationwide railroad strike in 1922 devastated Brainerd because it left most of the residents without jobs. As the economy slumped, Fred Reese began to think that he might have to take his family out West to find a new life. When his son Russell turned 18 in 1926, the family accepted the invitation of Albert Reese to have his nephew work for him at the bakery in Seattle. Russell must have liked the work and liked living in Seattle, and he may have encouraged his parents to come on out to Seattle, too. In 1927 Fred, Nellie and their daughter Helen, along with Nellie’s widowed mother Agnes, all moved to Seattle, where Fred, who was almost 50 years old, started a new career of working at the bakery. The two Reese brothers, Fred and Albert and their families, lived in the same block as the bakery on lower Queen Anne hill. The brothers worked together at the bakery for about ten years, 1927 to 1937. Fred’s children, Russell and Helen, had new educational and employment opportunities in the city of Seattle, which Fred and Albert had not had in their early lives in Minnesota. Russell and Helen each obtained jobs at the Sears-Roebuck store, took college classes, found spouses and started their own families in Seattle. The overheated U.S. economy of the 1920s gave way to the economic collapse called the Great Depression, set off by the Wall Street-New York stock market crash in October 1929. By 1932 many people all over the USA had lost their jobs and cut back on their spending. To economize, Fred and Nellie Reese, along with Nellie’s mother Agnes, moved to vacant land they had purchased in what is now Wedgwood, at 3804 NE 87th Street. Fred cut trees on the property and built a log-sided house with wood floors and no ceilings. It wasn’t exactly a “log cabin” but it was rural, as there were no other houses in that block and the house was not hooked up to electricity or city water. Well-water was used, and there were outbuildings on the site, including a chicken coop and storage sheds for tools and wood. The original property records of King County are stored at the Puget Sound Regional Archives in Bellevue. This property card shows the assessed value of the house at 3804 NE 87th Street. Even before the USA’s direct involvement in World War Two began in December 1941, which brought an influx of war workers to Seattle, the population of the Wedgwood neighborhood had been growing. Fred and Nellie Reese were typical of the desperate people who migrated to Wedgwood as a cheaper place to live during the Great Depression years of the 1930s. Wedgwoodians often juggled more than one job and had many sidelines such as cutting firewood, raising chickens and selling eggs. Some people in Wedgwood built tiny houses and left them tar-papered and without siding, to help lower the assessed value for the property taxes. On December 5, 1930, the Seattle Daily Times reported the suicide of CJ Townsend. During the economic low-point years of the 1930s, newspapers recorded the stories of suicides due to defeat and despair. 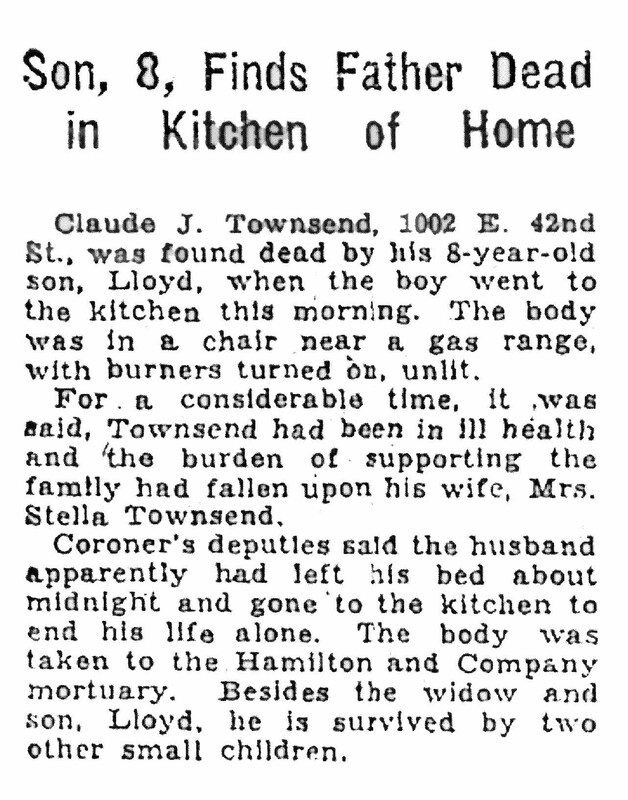 In December 1930 Albert Reese’s brother-in-law, CJ Townsend, age 47, killed himself by turning on the gas range in his home’s kitchen, succumbing to its fumes. It was reported that CJ had been depressed because of ill health and that the burden of supporting his family had fallen upon his wife, Stella, who had had to get a job. Stella and her three children remained close with the Reese family. CJ and Stella had been witnesses at the marriage of Albert and Edith (CJ’s sister) in 1911, and more than forty years later Stella’s signature on the marriage certificate shows that she was a witness at the 1954 wedding of her nephew Earl, Albert Reese’s son. Stella never remarried and she lived to be 96 years old, dying in 1979. Fred Reese continued working at his brother Albert’s Quality Doughnuts Bakery until about 1937 when Fred transitioned into working solely as a building contractor. He would coordinate all the supplies and workers needed to build houses in the growing Wedgwood area. It is likely that he had done this contracting “on the side” until he felt confident that he would have enough income without having to work at the bakery as well. 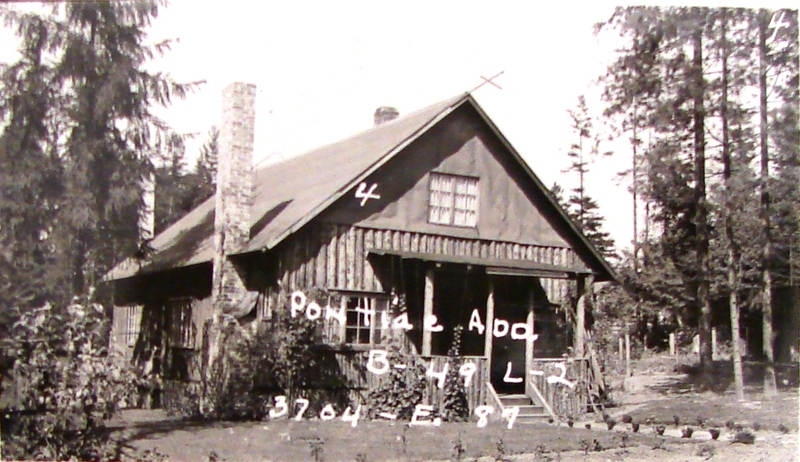 Fred and Nellie only lived in their partially-finished log house on NE 87th Street for about five years, 1932 to 1937. Nellie’s mother Agnes died in 1935 and in 1937 Fred and Nellie built another house, on 30th Ave NE near NE 75th Street, with the intention that their daughter Helen and her family would live in the house with them. The ability to build another house for his own family in 1937 indicates that Fred Reese had been successful as a building contractor and he was able to climb up from the depths of the Great Depression economy. At age 60 in 1938, Fred and Nellie had made a complete circle of life: they were now the parents and grandparents in the home they were sharing with their married daughter Helen, just as when they were a young couple and they had lived with Nellie’s parents. Helen’s husband, Ronald Biles, was a UW graduate and worked at a chemical manufacturing company. He was in the Navy reserves and was called into active duty during World War Two. Lieutenant Commander Ronald Biles was lost during a battle in the Pacific on or about May 1, 1945, at age 32. He left Helen to raise their seven-year-old son Richard, with the help of the Reeses. The house at 3804 NE 87th Street as it looks today. The log house at 3804 NE 87th Street is unrecognizable today as it has been remodeled several times, beginning with L.C. Joslin, who bought the log house from Fred Reese in 1937. Joslin enjoyed home projects and told the story of his work in a 1956 article in the Wedgwood Echo neighborhood newsletter. He told that 38th Ave NE was not put through on that block until the 1950s and a maple tree had grown up where the street should be. 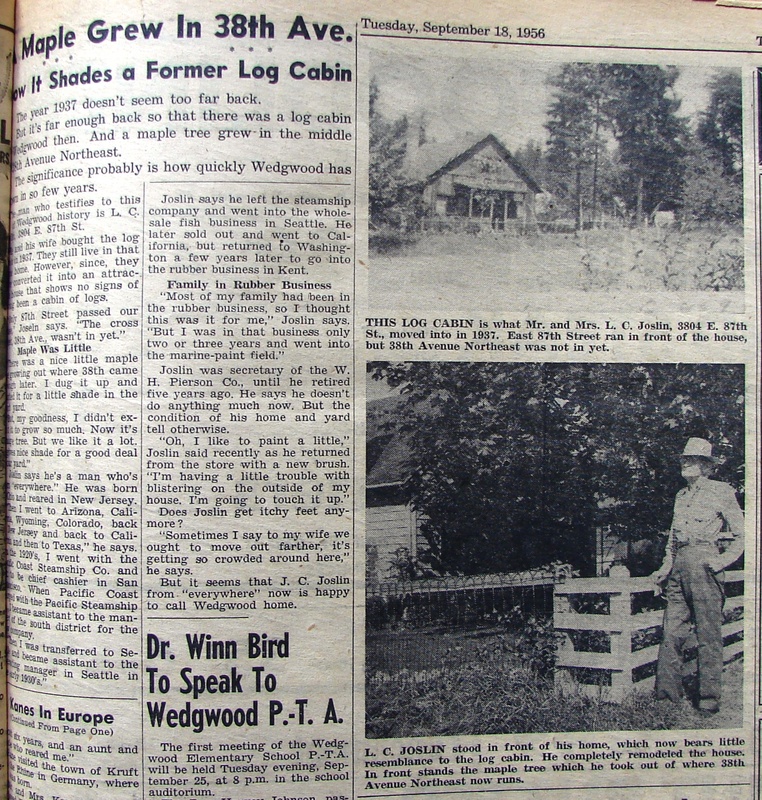 The photo of Mr. Joslin with the article showed that he dug up the tree and planted it in the front yard of the former log house. In 1956 L.C. Joslin, second owner of the log-sided house at 3804 NE 87th Street, told about the house for readers of the Wedgwood Echo neighborhood newsletter. Some of the research for this article was done via on-line resources, such as the census and newspaper search which are accessible from the website of the Seattle Public Library. On the King County Parcel Viewer, by clicking through to “property detail” you can see present and previous photos of a house. The Washington Digital Archives has census, birth, death and marriage info including many marriage certificates like the ones I have referred to in this article. City directories: On the 9th & 10th floors of the downtown Seattle Public Library are directories going back to 1890 which give a person’s address and occupation. I used these to determine what year Fred Reese came to Seattle: the family was first listed in the directory for 1927, but their son Russell was here in 1926, living at his Uncle Albert’s house and working at the bakery. 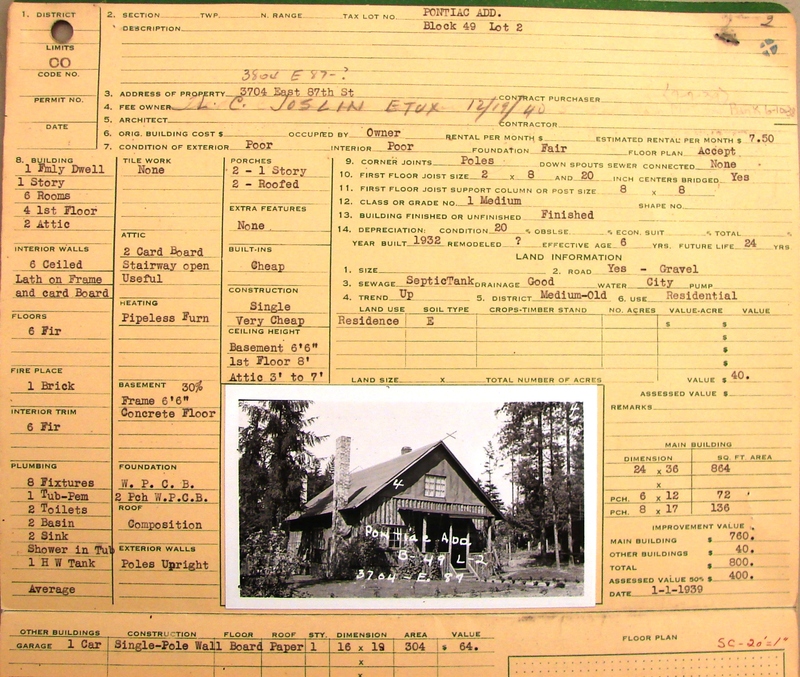 Property records: The Puget Sound Regional Archives in Bellevue is the repository for the original property records of King County. 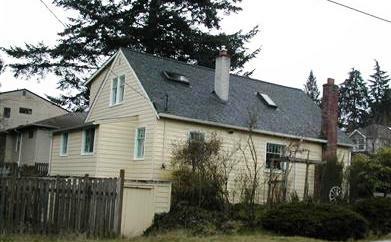 I went there on February 27, 2014 to look at the records for 3804 NE 87th Street, to determine who built the house and the date of when the house was sold to the next owner. Seattle Street Directional Designations: The street designations were changed in 1961. Before that streets in Wedgwood were referred to as East, and are now referred to as Northeast. Original property tax assessment rolls like this one for 1935, are kept in temperature-controlled vaults at the Puget Sound Regional Archives in Bellevue. Line 8 shows that in 1935 the assessed value of Fred Reese’s log-sided house was $450. This entry was posted in Houses and tagged Great Depression of 1930s, How to do house history research, Original property records, Property card, Seattle. Bookmark the permalink. What great research Valarie. I love your work and the interesting tidbits you have found out. Sad about the man who killed himself with the gas fumes. So many men identify themselves with their livelihood and if that is gone, they feel as if they are no good anymore. It is a very sad commentary on the pressures we have placed on men in our society. Thank you, Alesia. One of my purposes in this article was to show how much can be found out by tracing people through documents, including marriage certificates. I was amazed to see the signature of CJ Townsend’s widow, Stella, on the marriage certificate of her nephew in 1954. This shows the continuing love and support of the Reese family. My other purpose was to show what life was like during the 1930’s. Some people like CJ Townsend succumbed to despair. Others, like Fred Reese, showed courage and perseverance. The Reeses took refuge in Wedgwood where they could live more cheaply, and juggled jobs and sidelines until they made it through the difficult economic times. Excellent article connecting various documents to tell the story. Certainly similar to the kinds of info we like to provide for homeowners of our Ballard Classic Home tour houses. Thanks for a great read!